Since the first day Ivie Drake stepped onto Georgia State’s campus in 2014, she has familiarized herself with success. Looking at the stat sheets, it’s only been smooth sailing for the four-year starting catcher. Challenges also left a mark on her time in Atlanta. Drake simultaneously became Georgia State’s all-time home run leader and earned a 3.91 GPA. During a talk with The Signal, Drake brokedown her time at Georgia State, including how she’s manages to excel at both components of being a student-athlete. Drake wasted no time decorating the Georgia State and Sun Belt Conference softball record books. In her freshman year, she was named Sun Belt Freshman of the Year and All-Sun Belt first team. More outstanding accolades for the freshman included leading the conference in batting average, doubles, hits, on-base percentage, pickoffs and total bases. A few impressive moments from senior Ivie Drake’s career include a 13-game hitting streak in 2015. She hit that mark as a reserved freshman, but also had a 12-game hitting streak as a vocalized junior in 2017. “I’m definitely more of a leader by example. This year and actually the past couple of years I’ve tried to be a lot more vocal, but I think my strongest leadership role is leading by example,” Drake said. No Panther could be better to follow by example than the record-setting Drake. She’s made All-Sun Belt teams as a freshman, sophomore, junior and is on her to do it again as a senior— the entire roster can use Drake as an open book. “I think it’s good because I’ve been here four years and I know a lot of these players class-to-class. I can help at-bats, say what the pitcher’s throwing and always have advice if anybody needs it,” Drake said. Just as she found a recipe on the field, she has one in the classroom. Each year since enrolling into Georgia State, Drake has made an academic list. After making the Dean’s List in the springs and falls 2014, 2015 and 2016, she raised the bar by making President’s List in both 2017 semesters. The biggest piece of advice Drake has for incoming student-athletes is to learn time management skills. She keys in on softball and academics one at a time. “Managing when you need to do what. I come here and I don’t care if I have three tests the next day, I’m only focused on softball when I’m here. Soon as I step outside through those gates, then I can stress out,” Drake said. Drake isn’t the most boisterous or charismatic player on the team, but she’s more comfortable stepping outside of her comfort zone in comparison to her first day in the softball facilities. Although it’s a recently acquired skill for her, Drake understands how to give constructive criticism and not berate a teammate. “And also not even being mean, but being uplifting and giving them the confidence they need,” Drake said. Dealing with successes such as first-team conference honors as a freshman could’ve caused complacency, but Drake knew at 18 room to improve existed for her next season. After being a Sun Belt standout as an underclassman, Drake finished top-35 nationally in walks (29th) and on-base percentage (32nd) as a junior. She was named to the 2017 NFCA All-South Region Second Team. “Honestly, you have to work on the small things. Hitting is mental. Catching, you know, I just do the basics at practice. Hitting is really mental so just working on mechanics, doing the small things, hitting off the tee. That’s really where you got to put the work in to see improvement,” Drake said. The process isn’t over for Drake yet because she’s still holds a spot on the roster. 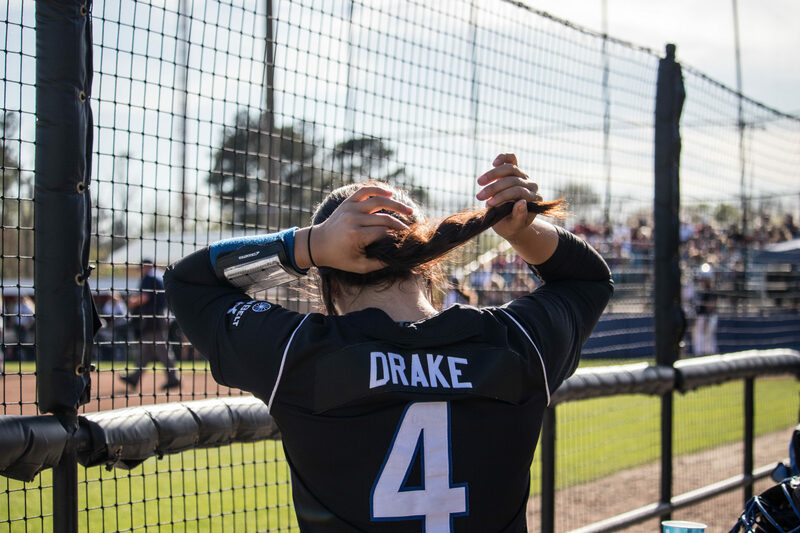 As recently as last week, Drake showed up early to Robert E. Heck Softball Complex so she can get some extra reps in. “I’ve seen the ball well, but I think that I did okay today. But I haven’t been seeing it as well as I thought I could, so the past two days Megan (Litumbe) and I have been coming in early and hitting. So yesterday and today, I actually came in an hour early and hit just to try to get my eye on the ball and it payed off for me,” said Drake. The day Drake described as ‘okay’, Saturday March 31, included a walk off home run, grand slam, three home runs, .571 batting average, 6 RBIs, four runs and three walks. Her hunger for improvement is never about personal gain— when she speaks about goals, they revolve around the 19 others on the team. Sometimes, doing what it takes to win includes lining up at other positions for Drake. Even as a freshman, she started 11 games outside of catcher and she regularly plays first baseman in on-conference games today. Mandy [Blackwell] out at catcher. It gave an extra person in the lineup that they could put in if they just put me at first and put Mandy at catcher,” Drake said. Quirks such her flexibility created memorable moments over Drake’s career. Last Saturday, Drake caught the first base coach for Troy off-guard when she found Drake standing feet away from her. However, it’s the small moments Drake will cherish more than anything that happened in front of the crowd. “The things I remember most of the time are always at practice when we play 21. It’s such a stressful time because we have to get 21 outs in a row, but as soon as a we get that last out, it is the best feeling in the world. Everyone runs together, everyone’s slapping hands, so that’s just such a good feeling that I’m going to miss when it’s all over,” Drake said.